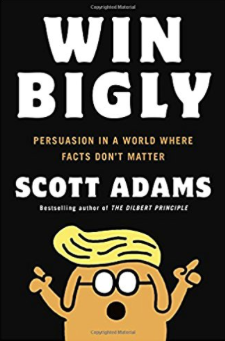 I recently read “Win Bigly: Persuasion In A World Where Facts Don’t Matter” by Scott Adams. Below are the quotes I found most interesting. If you like the quotes, click here to buy the book. Make a claim that is directionally accurate but has a big exaggeration or factual error in it. Wait for people to notice the exaggeration or error and spend endless hours talking about how wrong it is. “Fear can be deeply persuasive. But not all fear-related persuasion is equal. To maximize your fear persuasion, follow these guidelines.